Disconnect the iap sensor (2) from the vacuum hose. Disconnect the stva lead wire coupler (3). Disconnect secondary fuel injector couplers (4) and primary fuel injector couplers (5). Disconnect the isc valve coupler (8). Place a rag under the fuel feed hose (9) and disconnect the fuel feed hose from the fuel pump. 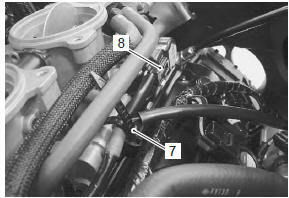 models, drain fuel from the fuel tank before disconnecting the fuel feed hose to prevent fuel leakage. Loosen the throttle body clamp screws, left and right. Lift up the throttle body from the intake pipes. 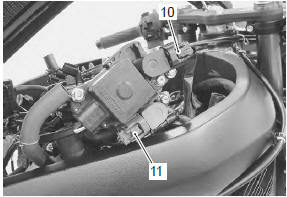 Disconnect the stp sensor coupler (10) and tp sensor coupler (11). after disconnecting the throttle cables, do not snap the throttle valve from full open to full close. It may cause damage to the throttle valve and throttle body. 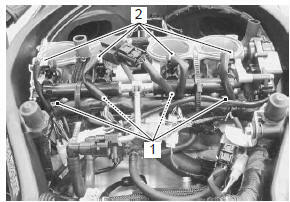 connect the primary injector couplers (1) and secondary injector couplers (2) to the respective fuel injectors. Make sure that each coupler is installed in the correct position. The color on each lead wire refers to the appropriate fuel injector. Connect the throttle cable no. 1 (3) And throttle cable no. 2 (4) To the throttle cable drum. Loosen each throttle cable lock-nut. 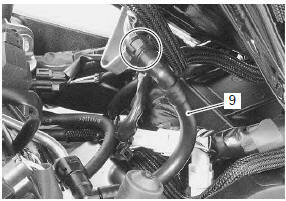 Turn in each throttle cable adjuster fully and locate each outer cable so that the clearance “a” is 0 – 1 mm (0 – 0.04 In). Adjust the throttle cable play. 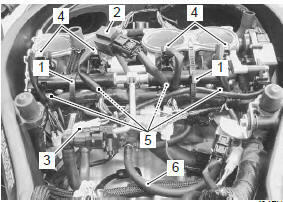 Refer to “throttle cable play inspection and adjustment” in section 0b . Reset the isc valve and tp sensor learned values. Refer to “isc valve reset” and “tp reset” .